LONDON--(Korea Newswire) January 22, 2013 -- Alpari World Match Racing World Champion Ian Williams was at the Garrard and Co in Mayfair, London today where he was presented with a Britannia silver Alms dish by the Tour in recognition of his title success last season. Having captured the title at the final stage, the Monsoon Cup, in December with his GAC Pindar crew, Williams equalled Peter Gilmour's all-time record of four World Championships. The trophy was designed and created by Garrard, the Tour's Official Jewellery and Silversmith partner. It was first awarded to Ian Williams in 2011 however the names of each winner since the first ISAF Match Racing World Champion was crowned in 1988 are also engraved on the trophy, including Dean Barker, Russell Coutts, Ed Baird and Ben Ainslie. From 2006, the winner of the Alpari World Match Racing Tour has been awarded the title. Speaking about what it means to have his name engraved on the Tour trophy, Williams said: "The history of the Tour is fantastic and I'm so pleased to have my name alongside some of the sailing greats who have also won this title. This specific trophy was first awarded to us in 2011 so with 2012, that makes it two from two! Garrard was founded over 275 years ago and has a rich history of designing and creating major sporting trophies including many in the sport of sailing. As well as the America's Cup, Garrard also created the oldest sailing trophy in the world - the Cumberland Cup, which was first awarded in 1776. 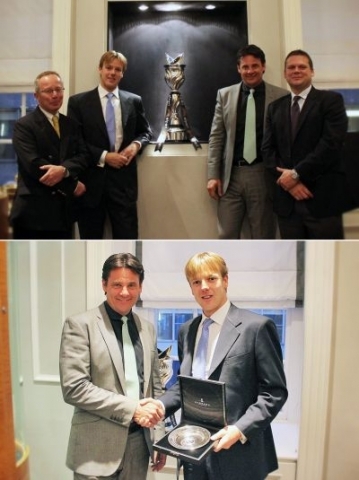 The Alpari World Match Racing Tour trophy will now remain at Garrard's flagship store in Mayfair in the Queen Mary Room until the 2013 season gets underway at Match Race Germany in May. The Alpari World Match Racing Tour (AWMRT) is the leading professional sailing series featuring eight World Championship events across the globe, sanctioned by the International Sailing Federation (ISAF) with “Special Event” status. The World Tour awards over US$1.75million in prize money with points awarded at each event culminating in the crowning of the “ISAF Match Racing World Champion”. The prize fund includes a US$500,000 overall prize pool for the top nine teams in the Championship. Events take place in identically supplied racing yachts to place the focus on team work and skill. Racing takes place close to the shore so that spectators and fans can follow the racing in a virtual on-the-water stadium. For more information, visit www.wmrt.com .